I do believe the "Phuket Gateway" to be Phuket's least visited attraction. We stopped for a look on the way back into Phuket a couple of weeks ago and were the only visitors save for 1 other foreign guy. My parents stopped in yesterday and were the only visitors. My daughter has been there on a school field trip. Now, I am not suggesting you should get off the beach and drive right up to the north end of Phuket island, which can take over an hour from the south, just to see this monument, but if you are passing, coming over the bridge from Phang Nga province, it's worth a stop, you might even learn something about Phuket! 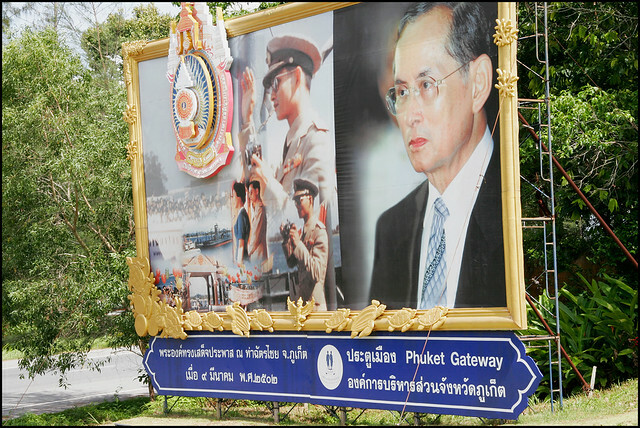 The Phuket Gateway was completed in 2007 on the occasion of King Bhumibol's 80th birthday. 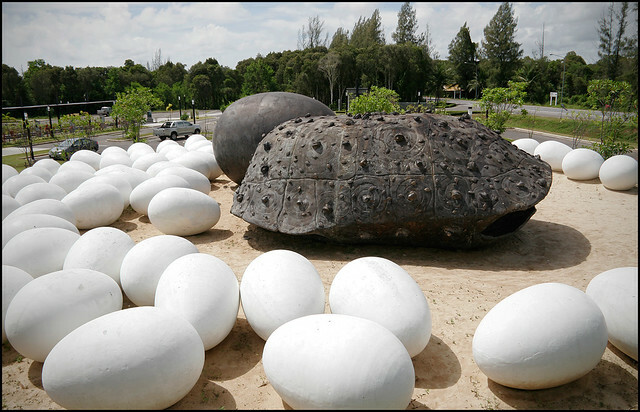 The idea was to create a dramatic and interesting sculpture to welcome tourists who arrive on Phuket by road. Only trouble is, not many people visit - most tourists arrive by air, and since the airport is south of the monument hardly anyone sees it. You might pass by on a tour to Phang Nga, but the tour bus will not be stopping there. Shame, because it really is a nice place to stop for a look. 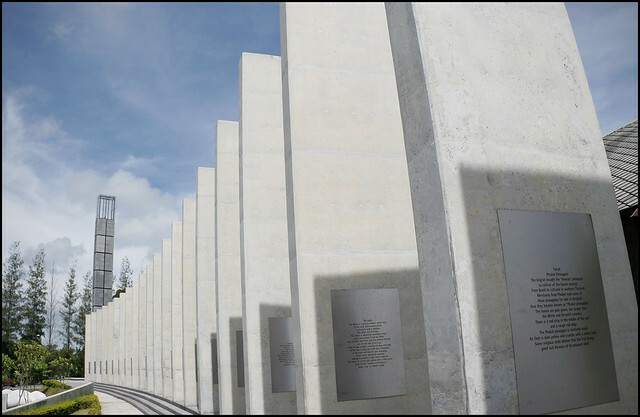 The main feature is a series of 29 pillars. The number 29 is not an accident - the numbers represent the two heroines in the war with Burma in 1785, Thao Thep Krasattri and Thao Sri Sunthon and the ninth king of the Chakri Dynasty, King Bhumibol Adulyadej. 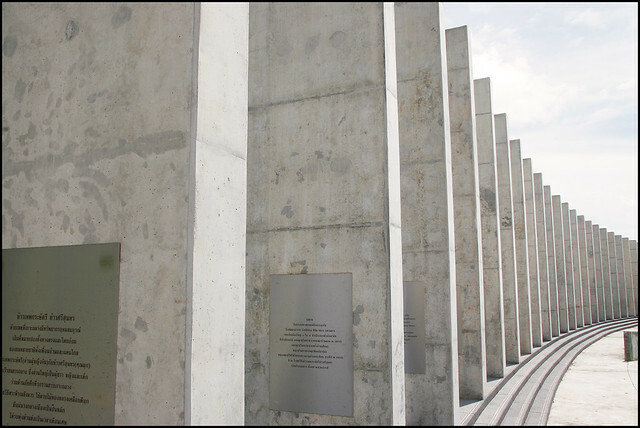 Each pillar includes an engraved plaque, such as the one below, each one telling a little of the history and local culture of Phuket. See - you can learn things here! There's also a small tourist information center in one of the buildings behind the monument, as well as a little shop and a very small art gallery. There are gardens around the monument, a nice spot for a picnic or a drink in the shade if you are exploring the north of Phuket. 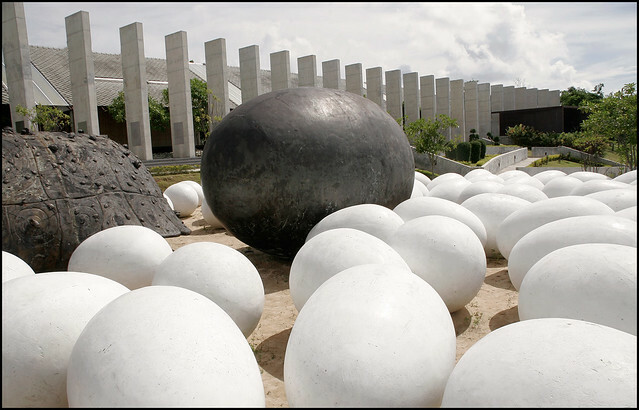 Also, you find a huge turtle shell surrounded by eggs. Turtles do very occasionally come ashore in the north of Phuket to lay eggs and there are a couple of turtle breeding centers in the Phuket area. We attended a turtle release ceremony on Songkran day 2007 at nearby Mai Khao Beach. The Phuket Gateway is certainly well intentioned, and is well cared for, but there seem to be more staff than visitors! The local community is aware of the lack of visitors and in September 2008 there was meant to be some kind of choice made by the locals in that area of Phuket - what to do with the Gateway? Well, so far nothing has changed - it's still a nice monument and worth a short stop if you are passing. Update 2017 - this blog post was written in 2009 - the Gateway is still there and I have seen a couple of discussions in the local news about what to do with it! Most recently, earlier in 2017, an idea was suggested to turn the Gateway into a shopping outlet selling Phuket products (read more here).